Now going on 17 years, Bike Week LA 2011 is packed full of community events and rewards for riding your bike. Celebrate Bike Week LA 2011 from May 16 - 20. Start off Bike Week at the North Hollywood Station at 8:30 am. 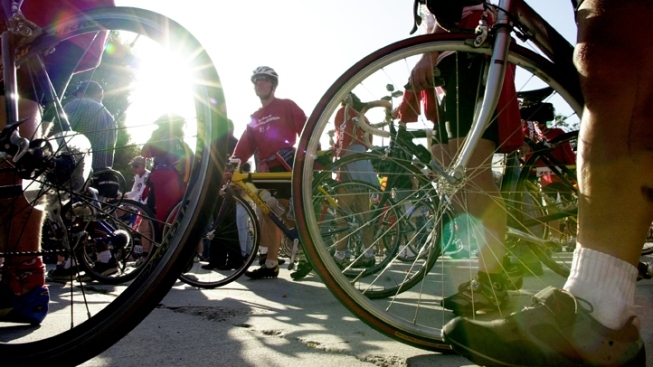 Learn all about Bike Week LA 2011 and pledge to ride your bike to work or school online. Round up your crew and make friends with a heap of other bike fans at Union Station for an 8 a.m. cruise down Alameda Street. Route map. Enjoy several incentives to change up your routine and ride your bike to work. Free fares will be offered to cyclists for public transportation services such as Metro and these partners and sponsors. A ton of morning bike week Pit Stops will also be stationed all over town offering free snacks, bike checkups and bike riding information. There is also a chance to win cool prizes like Target gift cards and bike accessories for officially pledging to ride your bike. Don't sweat it if you got a long way to travel, it is perfectly A-Okay to bring your bike on Metro Rail trains and busses. Support your local school and pledge to ride your bike to school online. Each pledging participant will get automatically entered to win cool prizes like a Commuter Cycling Package from REI. For more information about Bike Week LA 2011 visit www.metro.net/bikeweek.